The film club is kicking off a new season with a series of films that will take place once a month on a Saturday afternoon. 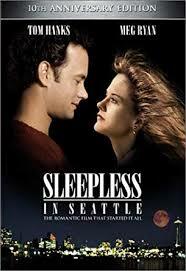 The first showing will be “Sleepless in Seattle”, a wonderful light comedy where a recently widowed man’s son calls a radio talk-show in an attempt to find his father a partner. Screening begins at 15:00 sharp and will be followed by a discussion in English. This activity is free of charge for all library members but if possible, please reserve by signing up at the front desk.